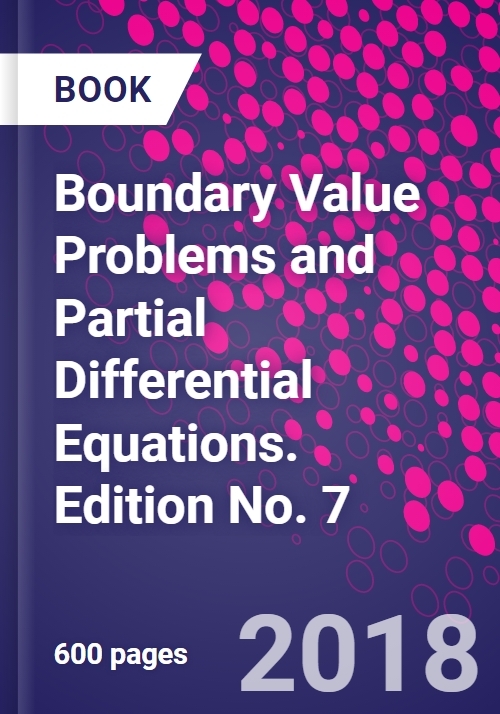 Boundary Value Problems and Partial Differential Equations, Seventh Edition, remains the preeminent resource for upper division undergraduate and graduate students seeking to derive, solve and interpret explicit solutions involving partial differential equations with boundary and initial conditions. Fully revised to reflect advances since the 2009 edition, this book aims to be comprehensive without affecting the accessibility and convenience of the original. The main tool is Fourier analysis, but other techniques including Laplace transform, numerical methods, and separation of variables are introduced as well. Examples and exercises are carefully selected from the literature based on popular problems from engineering and science. Features 35% new or revised content compared to the 2009 edition, reflecting a decade of advances. The book discusses all-new modeling techniques with derivations, which are often critically important in engineering. Includes coverage of elasticity problems, focusing particularly on Euler beam theory, as well as all new content on vibrating beams in wave equations. Joseph Skufca is an expert in applied dynamical systems and mathematical modeling. He has nearly 20 years of experience as a classroom instructor, with a significant portion focused on applied mathematics focused toward engineering applications. He has a national reputation for bringing modeling and real world projects into the classroom. David Powers has taught applied mathematics for over 40 years. His research includes matrix theory, graph theory and applications to biochemistry and engineering.